1. Kinesio Taping for Grade 2 Hamstring Tear. For these pictures the kinesio tape is applied on top of the clothes but should be applied directly on the skin. Firstly, round the corners of the kinesio tape with a pair of scissors. The tape should be applied to the hamstring on stretch. Apply 5cm of the tape to the upper glute- this will form the anchor for you to now stretch the remaining part of the tape along the hamstring until you reach the ankle. Prior to application attach two layers of Gripit active to each other. Round the edges of the tape, the tape should be applied with the hamstring being shortened. Apply double strength tape from the hip down to the back of the knee. This type of taping assists in muscle activation but it doesn’t restrict movement. Lie flat on your back with your knees bent and your feet flat on the ground. 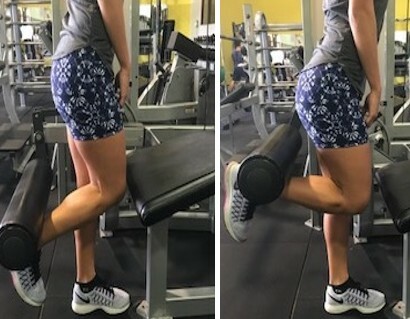 Feet should be shoulder width apart. Lift your hips up off of the ground without letting your hips sag down. Hold this position for 5 seconds and slowly lower your body down. Once you are strong enough, you will advance to single leg hamstring bridge. Holding the bridge position, lift one foot up off of the ground, keeping the lifted leg straight. Hold for 5 seconds then slowly lower yourself back down. Lie flat on your stomach on the floor or bench, bending your knees at 90 degrees. Place the uninjured leg below the injured leg. Lower the injured leg down whilst the good leg helps carry the weight. Lower your leg up and down. Do 8-12 Reps x 3 sets. Lie underneath the Smith machine with the ball of your foot pushed up against the bar. Once ready, drop the weight slowly down and then kick up as if were kicking the bar towards the ceiling, then slowly lower the weight down and repeat. Make sure the safety lock is in place before you start the exercise. Lie on your stomach with your knees on the edge of the bed/box. Start the exercise by holding the injured leg at 90 degrees. Slowly lower your leg down and ‘catch’ it just before it straightens. Be aware of moving too quickly. Secure your feet underneath a weight or let your friend assist you by holding your feet down. Start on your knees, keeping your body straight from your knees to your shoulders. Slowly lower yourself forward, keeping your torso straight, as far as you can and then catch yourself with your arms. Make sure that you control yourself down as much as you can with your hamstrings. Lie on your back, with one leg bent and one leg resting on an exercise ball. When you are secured, lift your hips up off of the ground and roll the ball towards you with one leg. The other leg that was on the floor needs to be off of the ground.